Step one is to have a assigned place for everything. After decades of seeing brooms and shovels all over the shop, sometimes 4 in one area and none in another, we put hangers around the building and presto, people now know where they go. That's the kind of thing you need to do. First - make a place for everything and put it all in its proper place. Everything. I'll repeat - everything. Planes, table saws, jigs, patterns, power tools, everything. Make specialized racks, sleeves, shelves, whatever. If you can't make a place for it, then you must toss it out. Do not violate this rule. 2. Do not let jigs, clamps, lumber, etc pile up in a corner or lean against the wall. Put them back in their place properly. This is called discipline. Do not violate this rule. 3.Do not let things gather so that you have to move one thing in order to get to another. If shelves are overflowing, build more shelves, and put the things you need in easy reach and the odd or rare things up high or very low. Keep the most used power tools plugged in and handy. Make easy hooks to loop cords over, or drop them from above. Do not ever search for a cord to plug in. 4. Daily - or several times a day - stop and put things back where they belong. Do not allow any horizontal surface to become a storage spot except temporarily. 5. You already sound motivated, but you must remain motivated. All this is no good unless you do it - You have to be the one. I have likened the inside of my shop to a model - an extension - of my brain. If it is cluttered and disorganized, so is my thinking and my behavior in the shop. If it is clean, neat, organized and predictable, then so is my behavior and my work. It makes a huge difference. I will second David's advice and add some specifics on how we stay clean and organized. We are almost exclusively dealing with hardwoods. Scrap: Don't let it pile up. It costs money in lost efficiency. Outsourcing scrap disposal is what has made it sustainable for me. Years ago, I ran a craigslist ad for hardwood kindling scraps and found a guy who has been taking away offcuts since 2004 or so. He now supplies me with sturdy bags, like the woven 50# seed bags, and comes once a week to haul off 6-8 bags or whatever we have sitting around. For or rip saw, I made a tall trough cart to keep them from spilling out into an aisle. I bought a strapping cart and when the trough is full, we dump it onto the forklift, snug the bundle up with ratchet clamps, and band it 5-6 times. We leave them in a designated spot outside and they either disappear or I have several people who are on a call list to come pick it up. For rips that are narrower than our standard S4S blanks, we bundle them neatly, take pics, and run a craigslist ad every few months. They go for cash within hours. Stuff does tend to pile up even with the above, so we end up doing a dump run once a year or so and everyone pitches in to deep clean and sort/red tag the junk. Yeah, man, David's a stacker: 's got everything in piles, and lots of room. In practice, those are probably work-flow stations. For me: not so much. As a one manner, that looks like work deferred. My mode is to never put off for later what I can do now. It gets me by. A job starts with setting it up, and ends with putting it away. Employees can learn this also. Nice shop. What is that large curved thing in the first pic?. It looks like the back of stairs, but I can't get my head around the geometry. Being a Navy Vet the Deck is always Broom Clean, it extended to have we leave a jobsite every time. Part of the routine and expectation. 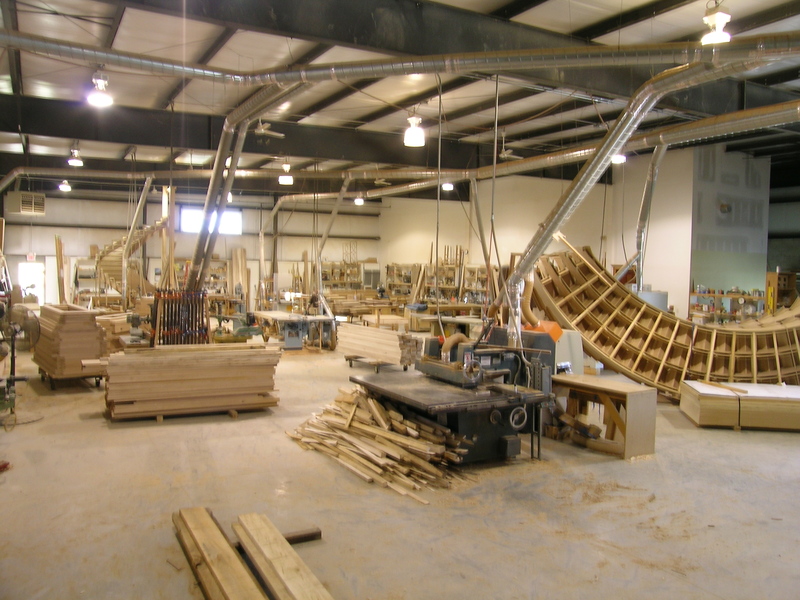 I visited a shop in Elgin SC some years ago and saw chips piled up, around an in Equipment some 24" + deep. After it burned down I made dang sure that cause would be eliminated. Brooms Pans and a Leaf blower !!! In the interest of full disclosure, the shop photos posted above are of my last 'big' shop. The one I gave up when the economy tanked. It was 8k s/f, a bit more than we needed, but we were easily growing into it when the world changed and our market disappeared overnight. The curved thing is a curved stair, about a quarter turn as I recall - on its back, with the underside showing - the easiest way to store such a beast. We built two for a job and the first one had to sit (we had the space) while the second one went up. The shop photos don't do a good job of illustrating my manifesto - especially the rippings on the floor. We had just moved in and temporarily lost discipline in our lust for all that space. Space is the easiest thing to violate in a woodshop. We had a forklift here, so it was easy to stage lumber on the floor and move stacks of doors from carts to the floor. I had about 12 heavy tubular steel carts that could each hold about 3,000 lbs, and these made everything portable and easily moved from machine to bench to wherever. We later built a trough cart for the rippings so we never had to touch them, and eventually had everything in its place, though it did take daily policing for a while. Currently, I have a 2 man shop in 1,000 s/f, with a loft. Quite a change from the big shop, but believe me, everything has a place and is in it, or it is obvious. Sort of like living in a VW camper - everything is fine as long as you put things back. If not, it only takes about 5 minutes to get it all back. I am now thinking about the vacuum bag and platen on a pulley system to store up against the ceiling when not in use. Sort of like the Dr Frankenstein's lift thru the roof, without all the electricity crackling. Ive read and heard old milwork shops would make and keep extra things like sash parts, but it just ends up taking up valuable space. Do you find this practice worthwhile? Unless it is a standard part of a product line that is made regularly, no. My employees are always wanting to squirrel away some extra material for the next job, but over time the material inevitably degrades - First of all, there is usually a reason why it is left over. Even if it is prime material (read worth something), it gets bumped and dented, it changes moisture content, it gets darker or lighter due to oxidation, and you can't reliably edge glue it without doing a fresh edge. Even if an appropriate job comes up while it is still useable, it often gets overlooked because it is hidden away and more scraps get added to it. Our scrap bags hang next to every saw. At the end of a job it is satisfying to cut up the junk that got picked over and let someone burn it. Since the material is part of the job cost, it pays to only run what is needed. This is an ever-changing target depending on the meaterial quality, but worth pursuing. Everyone makes mistakes and the parts always get placed somewhere for future use on the next job. They sit there for years each time you see them it reminds you of some screw up. Mentally the best move I made was to gain closure by cutting that mistake up and burning it in our woodstove. Forgot to mention: We bought a waste grinder. We can take a yard of board drop offs and grind them into a 10 gallon can of chips. Big help. And no more overloaded dumpster. During the LIGNA show in Germany in 2012 while touring window and door shops with Greg Godbout from Rangate a fellow that runs a woodworking school showed us Blickpunkt Werkstatt Tischler Schreiner. 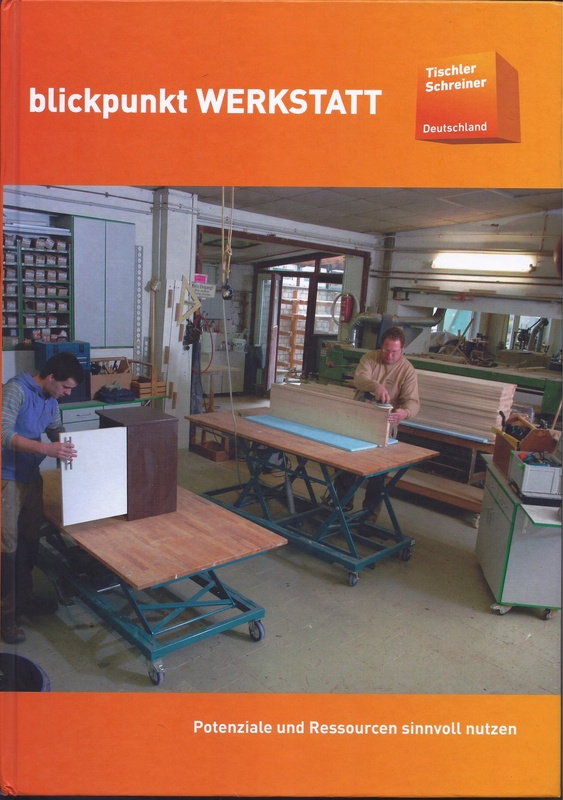 It contains many ideas for organizing a workshop on the industrial/production level. There are lots of pictures so reading German is not required. I did a google search and found a link to the book. It was around $100 with shipping but well worth it. In the Bible, Book of Proverbs is the following proverb: Where no oxen are, the crib is clean: but much increase is by the strength of the ox. Temperance is a good thing. Too much into cleaning and little gets done. No cleaning and little gets done. We have a sign in The Ark Factory that reads: "Keep All Thy Oxen out of the Shop for Sake of a Clean Floor" This is good advise. He also has a video on 5S on youtube, but I can't quickly find it. Set expectations with your people of what you want. With scrap items put a value on the space it takes up, it changes the way you look at storing things you might use. 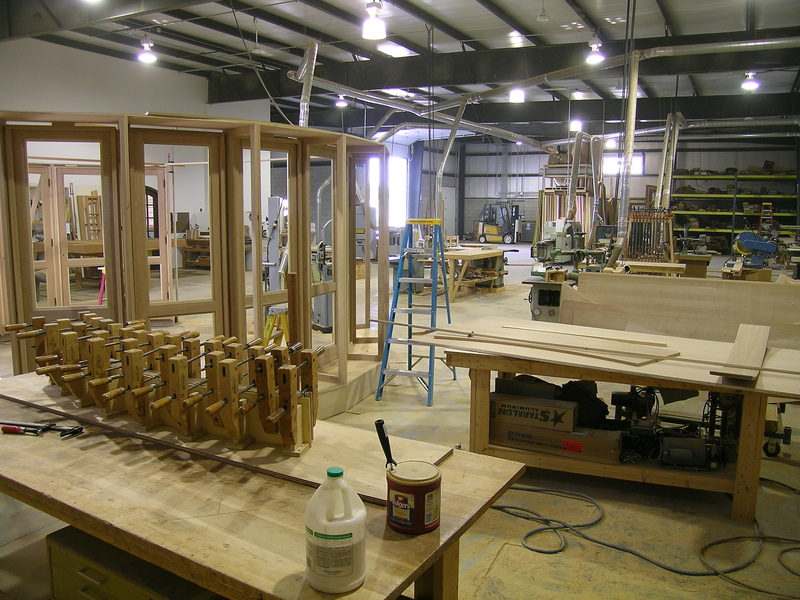 Set aside a time each week that you do major clean up and improvement in your shop. We have a guy who comes in Monday and Thursday nights and cleans the shop, which is about 3000 sq. ft. When he is done, the place is spotless. It helps a lot.